Without YOU this site would not be possible, so please write down setlists for the shows that you go to. Occasionally you can even pick up a printed copy of the setlist from any crew member after the show is over, and scans of these are also greatly appreciated. Thanks in advance and don't forget to follow us on Facebook and Twitter! While details of the forthcoming album The Mighty are slowly becoming available, O.A.R. has released studio version of 2 more of the songs from the album. O.A.R. 's 2019 summer tour has been announced! Supporting the tour are American Authors with Huntertones and Rozzi splitting the dates. The tour is presented by SiriusXM's The Pulse. A full list of dates can be found here! O.A.R. 's newest album is gearing up to be released! Pre-order the CD or digital album by Feb 12th @ 3pm ET to receive exclusive early access to pre-sale tickets for the upcoming 2019 summer tour! Upon order completion, you will be emailed your unique pre-sale code. These codes will also be available within your liveOAR Account. On Wed, Feb 13th @ 12noon ET go to liveoar.com/tour and click on the ticket link next to your show. Enter your unique code on the ticketing outlet's page to receive special early access to tickets! All pre-orders will also receive 2 instant early access download tracks on Fri, Feb 15th! Fan Pre-Sale will take place starting 10 AM local on Feb 14th with code mighty (all lowercase). General on sale for this summer's tour is Fri, Feb 15th at 10 AM local. The official music video for Miss You All the Time is now available. It's directed by Rudy Mancuso and produced by Shots Studios. The summer Just Like Paradise Tour, with Matt Nathanson opening, begins July 24. Pre-sale and VIP package sales start tomorrow, Tuesday February 13 at 12:00pm ET, thru Thursday February 15 (using code 'PARADISE'). All pre-sale tickets sold during O.A.R. 's fan presale include a free download of the new single. General public on-sale starts Friday February 16 at 12:00pm local time. To purchase tickets visit www.liveoar.com/tour. A full list of dates can be found here on oarsa.org. The tour is being named after the just released single "Just Like Paradise" that can be heard below. And be sure to read the billboard.com press lease with loads of additional information on the song, tour, and upcoming album. O.A.R. 's first 2 albums 'The Wanderer' and 'Souls Aflame' are available on vinyl for the first time ever! Only 300 Units of Each Album will be produced, containing unique picture-disc vinyls. Two Album Bundle Price of $130. PLEASE NOTE: All orders will ship by December 18th and all orders received by December 10th will have guaranteed delivery by December 22nd. O.A.R. has announced their new headlining shows for this fall... 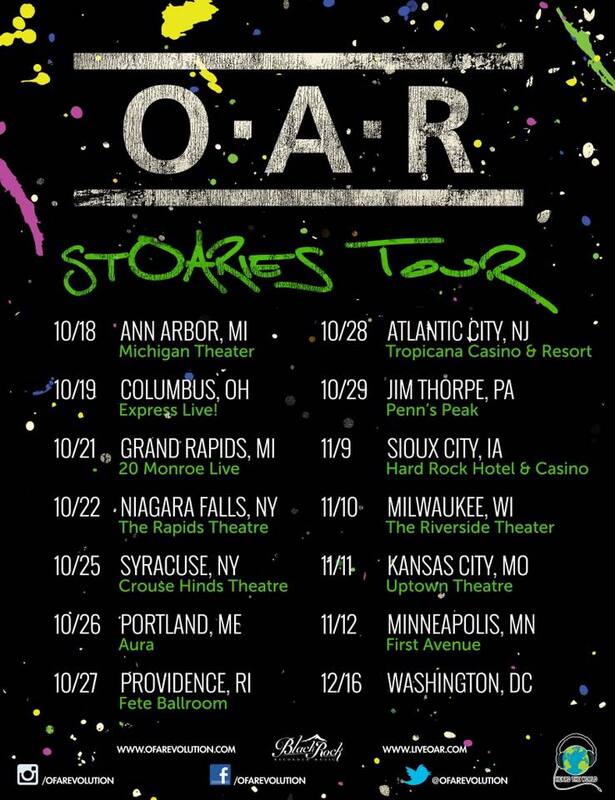 The stOARies Tour! VIP bundles with premium seating options included will go on-sale June 21st at 12pm EST on ofarevolution.com! These VIP packages will offer side stage seating during the band's performance, soundcheck experiences in select markets, and a chance to meet & take a photo with the band before the show! Tickets go on-sale to the general public beginning this Friday, June 23rd at 10am EST. A full list of tour dates can be seen here on oarsa.org. O.A.R. 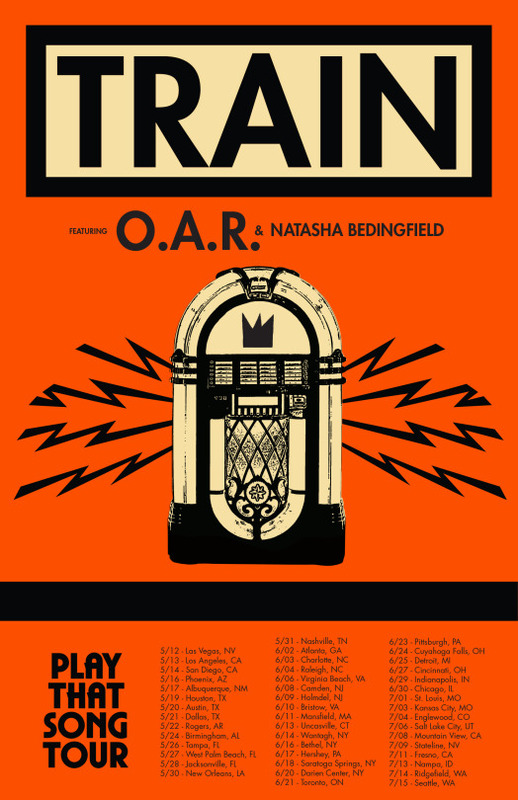 will join Train this summer for their lengthy Play That Song Tour across North America. Natasha Bedingfield will also be on the bill. Pre-sale tickets and VIP packages go on sale Monday, January 23rd at 10 AM local time. In order to get the presale code sent to you on Sunday, you must sign up for Train's mailing list by Saturday night. O.A.R. will also offer presale tickets and VIP packages starting Tuesday, January 24th with presale code ROCKVILLE. General on sale begins Friday, January 27th at 10 AM local time. A full list of tour dates can be seen here on oarsa.org. The XXmas Wish List Tour has been added to the end of the year with a few dates in NY/NJ! 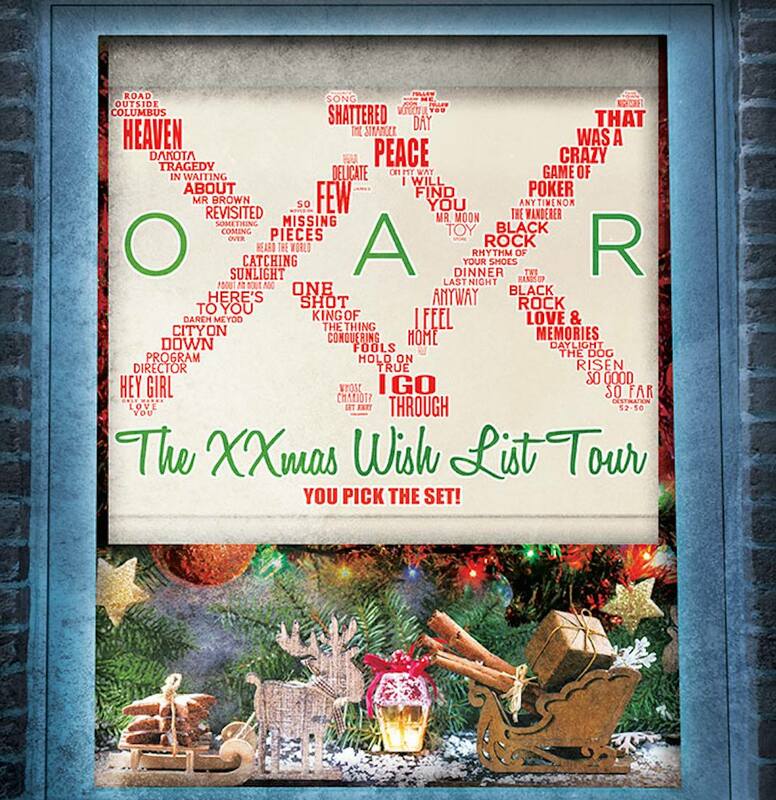 When you buy your presale tickets or VIP upgrades via Applauze at ofarevolution.com, you'll have the opportunity to vote (at LiveOAR) on which songs you want to hear performed at the XXmas Wish List Tour show(s) you're attending. Once you've completed your ticket purchase, you will be emailed a unique code that gives you access to vote on which songs from the band's entire catalog that you want to hear. All votes will be tallied, which you'll be able to track at at liveOAR.com as well. Presale begins 9/14 at 10am EDT. The final episode of Evolution of a Song series was recently released on Qello.